I had a Groupon for Fraiche, and it was burning a hole in my pocket. Fat Bruce Lee, Chi Burger, and I noted that Fraiche had a location near our world headquarters, AND there was a burger on the menu. Sold! We found free parking at the public garage about 1/2 block from the restaurant. In spite of it being a relatively light day in terms of business (25% full), the service was very spotty and slow. We ordered three of the the Truffle Burgers ($14 each), and we settled in for a 15-minute wait. The Beef: The beef blend in the burgers at Fraiche was composed of Chuck and Short Rib. The Short Rib contributed a firm, steak-like texture along with some aged funk. The Chuck lent beefiness to the flavor profile. The beef was loosely packed, and it seemed to be relatively lean. The low fat content coupled with some over-cooking on the edges lent a dry and crumbly texture to the outer third of the burger patty. The interior was juicy and firm. The beef was flavorful, but the over-cooking created an off texture for too much of the dish. The Sear: The sear was phenomenal. It was positively crunchy! This was accomplished by cooking the burgers on a very hot flat-top. The Seasoning: The burger patties at Fraiche were lightly salted while on the griddle. The seasoning was perfect when coupled with the strongly-flavored cheese. The Preparation: We were unable to learn anything about the preparation of the beef or fries. No one could tell us much about the food at Fraiche. The burger beef was loosely packed into irregular patties, and those patties were cooked on a mightily hot flat-top. The beef tasted like the Chuck was fresh, and the Short Rib had been dry-aged. It seemed safe to assume that the beef was not ground in-house. 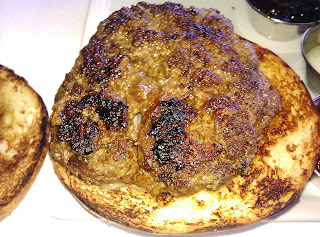 The strong sear came at the cost of over-cooking the edges of the burger patties. The Cheese: The cheese, which topped the burgers at Fraiche, was a Boschetto. Boschetto is a cheese made from sheep and cow milk with bits of white truffle. The semi-soft cheese was tender, sharp, tangy, and buttery. A little Boschetto went a long way, and it was superb on this burger. The truffle flavor was mild, and that was fine. The Bun: Sadly, the bun was a poor match for the beef in terms of sheer size. The voluminous brioche was fresh, sweet, and springy. 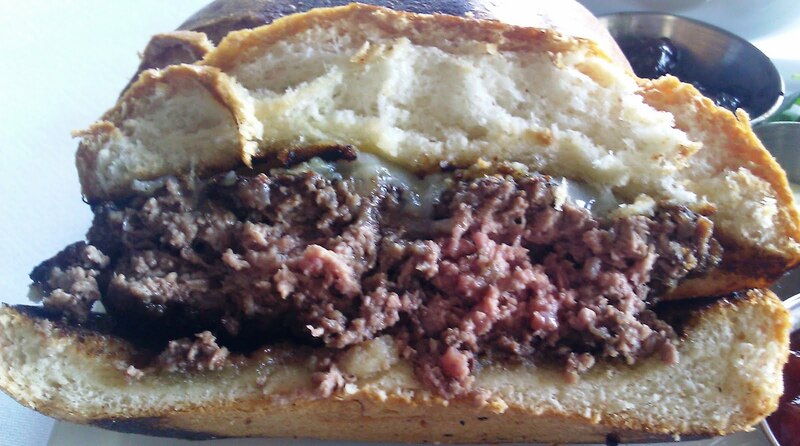 Due to its large size in comparison to the 8-ounce beef patty, the brioche served to dry out the bite. Additionally, there were a fair amount of beefless bites. The Meat To Bun Ratio: The bun was way too much for the over-cooked burger patty. 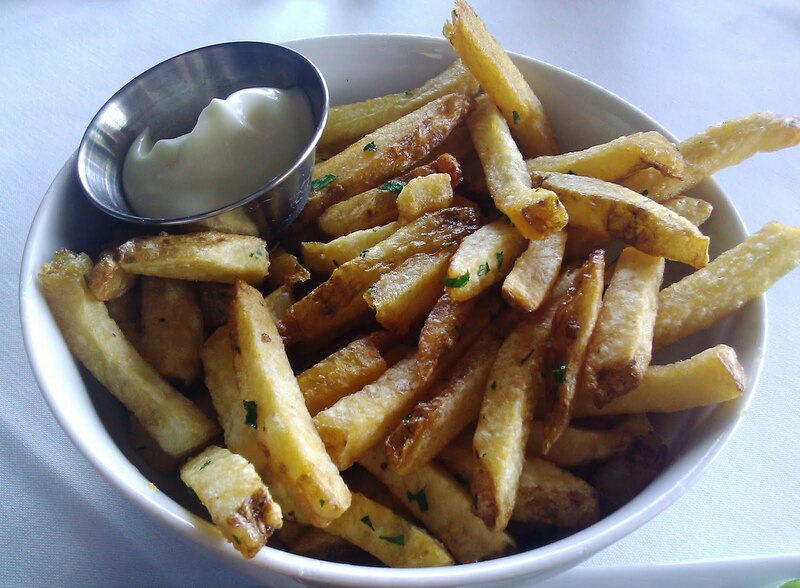 The Fries: The peel-on fries were properly browned and crisp. The oil was the star of the show, however...in a bad way. The fries were greasy and they tasted of burnt/stale oil. Fat Bruce Lee tasted one and relented. Also, the fries came out completely unseasoned. The Toppings: The garlic aoili was delicate and complemented the strongly-flavored carmelized onion fondue perfectly. The burgers at Fraiche were also accompanied by an arugula salad. The arugula was wonderfully fresh and nutty. 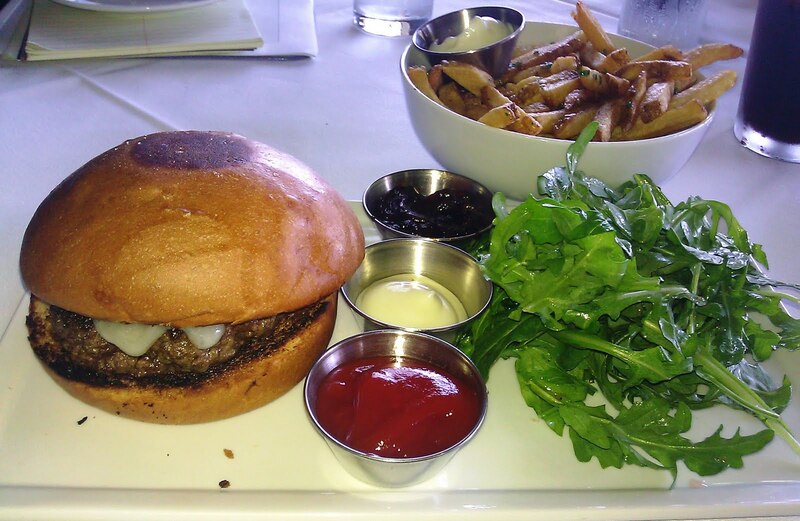 The Value: The Truffle Burger at Fraiche was $14. The beef and cheese were quite good. The bun and fries were not. The value at Fraiche was sub-par considering the meal as a whole. 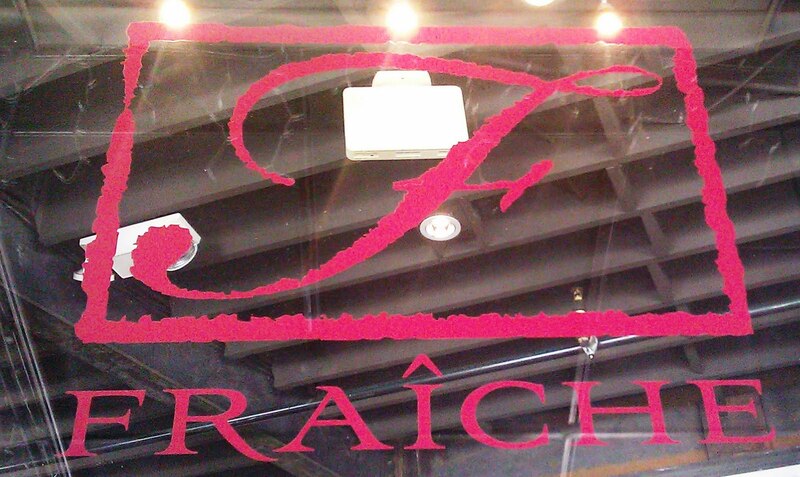 Fraiche seemed like it needed to work out some kinks in terms of service and ingredients. It was the best burger that we had reviewed in Culver City, CA. Its neighbors were Ford's Filling Station and Rush Street, both of which served non-excellent burgers. Rating...3 Bites This would have been 4 Bites had it not been for the bun, fries, and crumbly beef. However, the flavors of the beef and cheese were terrific. Your main (1st) picture of this review is absolutely riveting. I became instantly famished and ordered a pizza. I hope the pizza was good.